WheelTurnerHawaii.com: 2015 - 2016 Hawaii Winter Outlaw Series is COMPLETE. 2015 - 2016 Hawaii Winter Outlaw Series is COMPLETE. 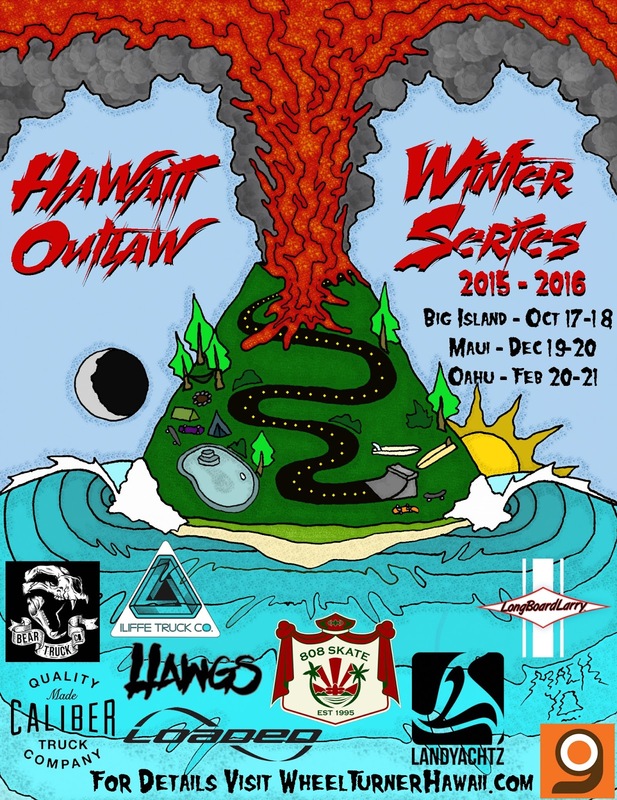 This past weekend, downhill skateboarders from all over the world gathered on Oahu for the final event of the 15' - 16' Hawaii Winter Outlaw Series. The 8th Annual Festival of Sugar and Love was the perfect festival to finish it off with a bang. On the first day of the festival we gathered at the Loop for the yearly FOSAL slide jam. Coming out on top of day one having the most fun and killing it all day was Dante Alston. Day 2 is race day. We met at the race course on the North Shore of Oahu, and after getting the jitters out during a fast first run… we got hit by RAIN! After trying to wait it out for a bit, we took a vote and made the decision to change courses. When arriving at the backup course, everyone was stoked to see the hill was perfectly playful and covered in sun. Coming out on top after several rounds of head to head racing was Dante Alston, making him our overall Festival of Sugar and Love Champion. Following the event we also added up the points to find our overall series champion. It was a CLOSE top 4, but coming out on top this year is the always consistent Dakota Camp. Mahalo everyone who came out and made it another great season. Check back for the full event write up, photos and videos! What kind of solution would you like to take? Winter is best for ice skating. So FUn and memorable. I wish just like I do good dissertation proposal I can ride this good too. Anyways, its good to see so many good people taking a part in such a big and interesting event.